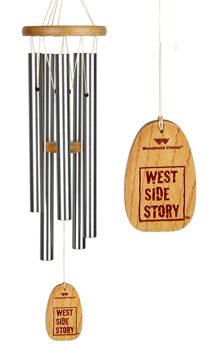 Created to honor Leonard Bernstein's 100th birthday, this chime sings out in honor of star-crossed lovers everywhere. Bernstein's score was inspired by a theme from Beethoven's Piano Concerto No. 5, popularly known as the "Emperor Concerto." "Somewhere" has become an anthem for forbidden love and has been recorded by The Supremes, Barbra Streisand and Phil Collins, to name a few.